It's Waiting There For You: Toto's 'Africa' Is Playing On Repeat In A Desert The life of Toto's "Africa" has perhaps reached its logical end with Max Siedentopf's absurdist art installation Toto Forever, which will play "Africa" in the Namib Desert "for all eternity." Namibian-German artist Max Siedentopf installed Toto Forever late last December while back home with his family in Namibia. From soft-rock smash to karaoke staple to Internet bait, the shelf life of Toto's 1982 smash "Africa" has reached remarkable, unexpected lengths. 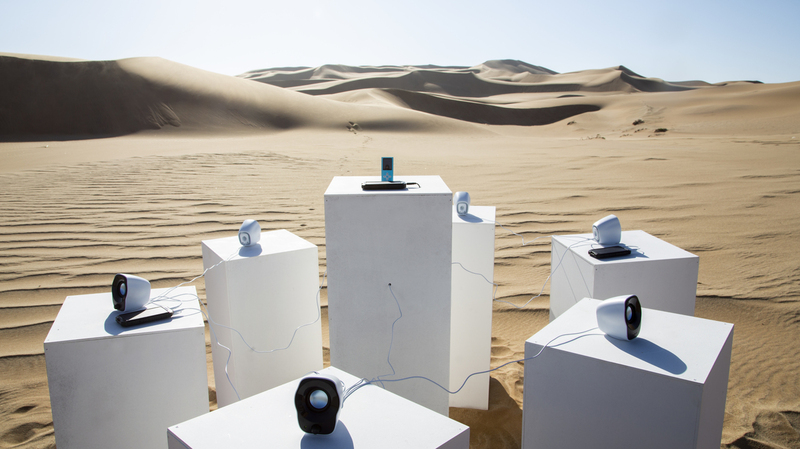 Perhaps it has finally reached its logical conclusion with one multimedia artist's new sound installation, which plays the 1982 smash on loop until the end of time deep in the, er, coastal Namib desert. Namibian-German artist Max Siedentopf installed Toto Forever late last December while back home with his family in Namibia. Six speakers are placed atop individual plinths and attached to an MP3 player that contains only the song; the entire thing is powered by solar energy with the promise that it will run "for all eternity." "I was very intrigued by this and wanted to pay the song the ultimate homage and physically exhibit 'Africa' in Africa," Siedentopf writes to NPR. "The Namibian desert — which is, with 55 million years, the oldest desert in the world — seemed to be the perfect spot for this." Intrepid fans might want to hunt down the shrine to Toto, and for those devout enough to embark on the journey, Siedentopf has enclosed a map detailing the site of the installation. But he cautions that fair-weather fans may not have much luck finding it. "The installation is supposed to be a bit like a treasure that only the most loyal of Toto fans can find," he cautions.